The last thing TigerBlog expected when he heard from Tom McCarthy Friday was that the former Princeton football and men's basketball play-by-play man and current Philadelphia Phillies television voice would end up in SportsCenter's top 10 plays of the day. When McCarthy checked in Friday, it was to ask for information about David Hale, the Princeton alum who was to pitch Saturday night for the Atlanta Braves against the Phils. And about Princeton's current Major Leaguers, and baseball execs. This was during the afternoon. Then, at about 10, TigerBlog got a text from his colleague Yariv Amir, asking if he had seen Tom's catch. TigerBlog replied that he had not, so Yariv forwarded to him a video clip. McCarthy was broadcasting from a location in deep centerfield at Citizens Bank Park, something that is done a few times a year, apparently. Freddy Freeman of the Braves launched a towering shot that made its way to where McCarthy was, and as he was calling the home run, he reached out with his glove and caught the ball without ever losing his train of thought. It was a fairly routine home run call and a relatively easy catch, especially for a former first baseman like Tom McCarthy. To do both at once though? Now that was impressive. It was so impressive that it reached SportsCenter's top 10 plays. Okay, it was only No. 10. Still, it was something that probably doesn't really happen too often, if ever. Think of everything that had to happen. They had to be broadcasting from the outfield. A home run had to be hit to their exact location. And he had to catch it. And why in the world would McCarthy be wearing a baseball glove at that exact moment? TB texted him after the game but forgot to ask him why he had the glove on and if he had worn it the entire game prior to that. After he caught the ball, McCarthy threw it back onto the field. TB wondered if the security people would take issue with that, which apparently they didn't, though TB doesn't recommend doing so if you happen to be a fan at the game. McCarthy's career has gone from writing at the Trenton Times to broadcasting Princeton and Rutgers to Minor League baseball to the Mets on the radio and now Phillies on television, along with work on radio and TV for NFL football and NCAA basketball. That's pretty big-time stuff. Among TigerBlog's best memories of his time at Princeton is the time he spent traveling with McCarthy when he was doing games here. TigerBlog couldn't even begin to estimate the number of hours he and McCarthy spend together driving back and forth throughout the Northeast and to every Ivy League school, as well as flying all over the country for basketball games. In fact, TB and McCarthy watched Princeton play in five different time zones - the four in the continental U.S. and the one in Hawaii, where TB and McCarthy went on Christmas Day 1998 for the Rainbow Classic, which Princeton would win. To this day TigerBlog figures he has not spent more time traveling with any other single person than Tom McCarthy. They were great times. Way back when, McCarthy did an ESPN radio show every afternoon, and on Fridays during Ivy League basketball season he'd do his show either from Jadwin or the away venue. 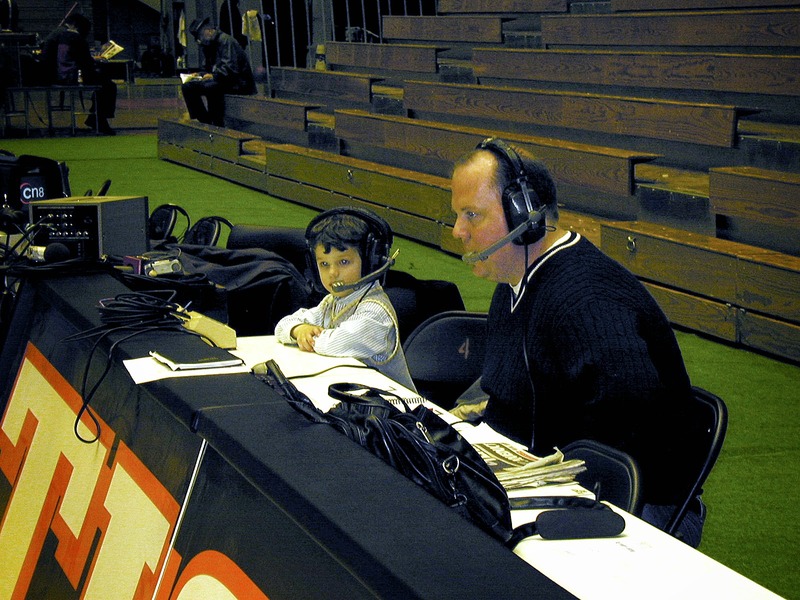 One of TB's favorite pictures ever is of a young TigerBlog Jr. with McCarthy courtside at Jadwin some Friday afternoon while McCarthy did his show. These days, McCarthy is constantly on airplanes and in hotels. It's the life of the Major League player and broadcaster. It's glamorous, but it's also grueling. Even when the Phils are home, it's a long day and longer night. And Saturday was a day-night doubleheader. Hale pitched Game 2 of the doubleheader, going five innings and getting the win as the Braves completed a sweep with a 5-1 victory. Now in his first full season in the Majors, Hale improved to 3-2, with a 3.02 ERA and a 1.30 WHIP. Hale has quickly developed in a very important member of the Braves' staff. He can start - something he's done five times - and come out of the bullpen - something he's done 19 other times. He has pitched 53.2 innings, with 25 strikeouts. He needs to cut down on his 23 walks, which is what has pushed him WHIP up, but he only walked one in five innings against the Phillies Saturday. What he's mostly doing is establishing himself as a legitimate Major League pitcher, something that is Step 1 for a 26-year-old pitcher he had 11 innings in the big leagues for his career prior to this season. As for the Braves, they're in what figures to be just a two-time race in the NL East, along with the Washington Nationals. Having someone like Hale is invaluable during the long summer. So far, he's been a good catch for Atlanta. Not as good as the one Tom McCarthy made, but still a good one. TigerBlog doesn't understand why everyone either associated with or rooting for the U.S. at the World Cup was content with what happened yesterday against Germany. Isn't the point to try to win the World Cup, not just get to the round of 16? The U.S. went into its game yesterday against Germany knowing a win would mean first place in the group (and can everyone stop saying "Group of Death" please?). Instead, the U.S. lost 1-0 in a game in which it had no shots on goal and the German goalkeeper therefore had to make no saves. Yes, the U.S. advanced to the knockout stage. Is that really all that matters? Four years ago, with a Princeton alum as the coach, the U.S. did that and also won the group, so a loss in the next game would mean that the U.S. didn't quite match what it did in South Africa in 2010. The U.S. moved on because Ghana lost to Portugal 2-1 and the U.S. had the edge on Portugal in goal differential. The Ghana-Portugal game provided some big drama, since it was 1-1 for awhile in the second half and a 2-1 Ghana win would have meant that Ghana moved on and the U.S. went home because of goal differential, even though the U.S. beat Ghana head-to-head, which doesn't matter. The point nobody seemed to want to make was that the difference between being first and second in the U.S. group was on paper at least astronimical. Germany, by virtue of its win, plays Algeria in the next round, and the winner of that game will play the winner of France and Nigeria. The U.S., by coming in second, plays Belgium, with the winner to play the winner of Argentina and Switzerland. Well, all three of the teams in Germany's part of the bracket are ranked below the U.S. in the FIFA rankings, while all three in the U.S. bracket are ahead of the Americans. That's a ridiculous gap. And yet nobody talked about it. The U.S. has to play the team ranked 11th; Germany gets the team ranked 22nd. Silly TigerBlog. He thought the point was to win the whole thing. Or at least do better than last time. Yes, advancing past a group that included Germany, Portugal and Ghana wasn't going to be easy and is an accomplishment itself. But what about at least some sense that a great opportunity to be ranked ahead of the other three teams in the bracket leading to the semifinals got away. Hey, maybe the U.S. can beat Belgium. Anyway, that was what TigerBlog noticed about the game yesterday. He also noticed that everyone around here was watching it. And everywhere else. Ratings have been great for the 2014 World Cup so far, and TB attributes that 1) to the rise of international soccer coverage in this country in the last 10 years and 2) the fact that soccer is a fairly perfect TV sport. The games fit nicely into two-hour windows. And there are no media timeouts. Think about the difference between watching an NFL football game, a college basketball game and a World Cup match on TV. The NFL has the dreaded score, TV timeout, kickoff, TV timeout, play situation in which the only live action in about a six-minute stretch is the kickoff, which often is a touchback anyway. And a college basketball game? There are nine media timeouts and up to 10 called team timeouts in regulation, and the last two minutes of game action regularly take 15-20 minutes of real time to play. Soccer has none of these issues. The game is played, and it never stops for artificial timeouts. As a result a 90-minute game is played in less than two hours. In football, a 60-minute game takes three. In college basketball, a 40-minute game takes more than two. ESPN must be making money off the World Cup, no? Even without TV timeouts. Perhaps there's something in there that could apply to the football and basketball games on TV? Speaking of basketball and Princeton, the Tigers' men's team will play in the Wooden Legacy in California this coming November, which will be here before you know it, TigerBlog surmises. Princeton will be traveling the furthest to get to the event, which will be held in Fullerton and then Anaheim. The other seven teams are Western Michigan, Xavier, San Jose State, Washington, UTEP, San Diego and Long Beach State. The matchups will be announced later this summer. For its long history of great basketball, Princeton has only played in Los Angeles once before. That was back in 1970, when Princeton played in the Bruin Classic. The Tigers defeated Indiana in the first game and then lost 76-75 to UCLA - who would win the NCAA title again - in the final. Princeton lost on a buzzer-beater by, as TB recalls, Sidney Wicks. Pete Carril was the Tiger coach back then. The win over Indiana was his 43rd at Princeton. The win over UCLA in the 1996 NCAA tournament would be his 514th and final one. He's right. Almost nobody talks about that game. TigerBlog saw Carril yesterday here at Jadwin. TB said hi, and Carril answered with a hearty "yo." TB asked how he was, and Carril said "still hanging in." Yes he is. His 84th birthday is next month, and yet he remains what he has always been - a personality larger than any other that has ever walked into this building. TB thinks that point is indisputable. And so it was, as it always is, great to see him. Anyway, today is a day off at the World Cup, which resumes tomorrow with the first knockout games. The U.S. plays Tuesday; will it be seen as a great run by the U.S. if it loses? TigerBlog thinks he watched more of the College World Series than he did of the NBA and NHL playoffs combined. That's not really saying much, since he hardly watched any of the pro playoffs. He definitely watched more of the NCAA men's lacrosse tournament first round than he did of all three of the other events combined. The College World Series ended yesterday, as Vanderbilt defeated Virginia in the decisive third game 3-2, snapping a tie game on a home run in the eighth inning from John Norwood. It was the first NCAA men's championship in Vanderbilt history, and the school's only previous NCAA title was in women's bowling. In case you don't have a calendar or a calendar app on your phone, yesterday was June 25. Or, in other words, it was long after school ended and graduations were held at basically every college in America. So is it a good idea or a bad idea to extend the season so long after the players are no longer in school? Graduation at Vanderbilt, for instance, was May 9; the last day of finals was May 1. On the one hand, the point of college athletics is that they are representing the school as students as well as athletes, and there is supposed to be a balance between the two, or at the very least in some cases the appearance of a balance between the two. In the case of playing long after school has ended, there is no academic component of any kind. And in this case, it's going on for nearly two months after that academic component has ended. Actually, going back to Vanderbilt's academic calendar, the players could be enrolled in summer classes, which began June 3, though there is no requirement that they are. TB wonders how many have been doing so. He'd guess the number isn't high. The reason for doing this, of course, is the weather. Why play huge baseball games in April when May and ultimately June are much more conducive to it? All of this takes TB to his favorite sport, lacrosse. Exactly four months to the day before the College World Series ended, TigerBlog stood on a field at Manhattan College and shivered while Princeton defeated the home team 14-8. Gametime temperature was 28 degrees; by the time it ended, it was about half that. The NCAA lacrosse championships for the men and women are both held Memorial Day weekend. Would it make more sense to start lacrosse season later and go into June for the championships? Forgetting things like academic calendars and the lacrosse culture and the history of having the final on Memorial Day, it would make unbelievable sense weather-wise at least. Most of the lacrosse world plays, what, 80% of its games before the Northeast spring turns consistently favorable. Maybe it's worth trying. TB doubts it will happen. If anything, it's likely that the opposite will be true, and the season will continue to start earlier and earlier. Anyway, the last out of the baseball game last night also meant the end of the athletic year of 2013-14 for college athletics. Though the final standings won't be announced until tomorrow, Princeton will be 44th in the final Learfield Sports NACDA Directors' Cup standings, which use NCAA championship participation and finish to rank the top programs in Division I, Division II and Division III. Once again, Princeton will be the highest finishing Ivy League school. In addition, Princeton will also be the fourth-best among teams not from the five power conferences (SEC, Big 10, Pac 12, ACC, Big Ten), behind Louisville, BYU and, of all people, Denver. This year is the 21st year of the Directors' Cup, which has had several different sponsors during that time. Princeton has finished in the top 50 18 times. The 2013-14 year is also the 18th time in those 21 years that Princeton has finished first in the Ivy League. TigerBlog always loves to look at the standings and see the teams that finished directly behind Princeton, because those are usually schools that devote much greater financial resources - and fully funded athletic scholarships - to athletics. This year, Princeton is No. 44. Who's next? No. 45 is Missouri. No. 46 is Illinois. No. 47 is Purdue. It will all become official when the final standings are released, probably tomorrow. The NACDA people had to wait until the end of the athletic year to do so. Long after the academic year. TigerBlog thinks it might be worth trying it for lacrosse. "In Fairness ... I Like To Bite Into An Italian Sub Too." So the one guy bit the other guy at the World Cup and then tried to pretend he didn't? And then the other guy kept trying to show his shoulder to the ref to show him the bite marks? TigerBlog is clearly all in on the World Cup. Hey, Costa Rica won its group and will play Greece Sunday for a spot in the quarterfinals. It's been a really great run for CONCACAF in the group stages. Costa Rica and Mexico both have advanced, and the U.S. probably will. Honduras probably won't, but that's still two definites and possibly a third of the four teams. Italy and England were in a group with Uruguay and Costa Rica, and the English and Italians are probably on the plane home right now. Spain is already home. Portugal will probably be joining them. It would be hard to find any World Cup pre-tournament predictions that didn't have a few of them in the knockout round, if not all of them. And had at least one of them getting to the semifinals. The European team that's looking good is the Netherlands, which went 3-0-0 in its group and outscored its opponents 10-3. Oh, and Belgium, who as everyone knows Princeton men's soccer coach Jim Barlow said to watch out for before the tournament started. The U.S. has its quick turnaround from Sunday's agonizing 2-2 tie with Portugal, in which the U.S. was seconds away from clinching a spot in the knockout round. Now the Americans have to take on Germany, the second-ranked team in the world, tomorrow at noon. In reality, it would take a lot for one of these teams not to qualify. A tie and they both advance. A win by one and the tiebreakers still favor the one that loses, unless the loser gives up a ton of goals in the process. For everything that TB loves about the World Cup, there are three things that continue to torture him. First, there are the timekeeping rules. They are a nightmare. Why can't the clock simply stop on the ref's signal, like it does in every other sport? If that had been the case, maybe Portugal never would have scored the tying goal. Second, there is the officiating in general. Either it's too much to ask for one ref to see everything (and for the assistant to see offsides) or maybe there are just more bad calls in soccer than any other sport. TB just doesn't want to see something like the World Cup decided by a terrible call. And lastly, there is the silliness of some of the players. They take way too many dives, often giving up on the ball in the process. They act like they have suffered life-threatening injuries at the slightest touch. It's ridiculous. And it ruins the game far too many times. And in the case of Luis Suarez, sometimes they bite. Now that's really, really ridiculous. Suarez should be on his way home too. There's no way that can be tolerated. On the other hand, it led to some great Tweets. The best that TB saw said "In fairness to Suarez, I like to bite into an Italian sub too." Anyway, what does any of this have to do with Princeton sports? Nothing. But give TigerBlog a break. The biggest thing in the world right now is the World Cup. Around here, it's pretty quiet. People often ask Tigerblog if he works in the summer, or if positions in the athletic department are 10 months, like the school year. The answer is yes, he works all summer. It's just that there are no events. In fact, the last athletic event of the 2013-14 academic year was the NCAA track and field championships, which ended June 14. The first athletic events of the next academic year are, TB believes, Sept. 5. That makes it an 83-day gap from the end of one year to the next. Today would be Day 11 of 83, or 13.3% of the way there. In other words, there's a long way to go. The mid-way point would be Day 42, which would be July 28, and that's still a long way off. Right now goprincetontigers.com is filled with stories about schedules for next year, athletes and coaches (current or alums) who are receiving some special honors and the kind of stuff that fills a webpage in the summer. TB believes that it's important to keep coming up with as much new content in the summer as possible. It keeps people coming back. If the same picture greets you when you get there, then you figure there's nothing new to see here and go off to some other site. In fact, the news never really stops flowing all summer. It always amazes TB. For that matter, there's always something for TigerBlog to write about all summer as well. Some days it's a little more Princeton-centric than others. Today wasn't one of them, but hey, what do you expect on Day 11? TigerBlog's first line today will be his last line from yesterday. Well, let him put that another way, since he's already on his second line of the day and hasn't gotten back to yesterday's last line. How about this: TigerBlog's will essentially start today where he left off yesterday, when his last line was this: "If you're still ho-humming the World Cup, you're missing out big time." TB got a few emails yesterday about that, from people who said that they were in fact ho-humming the World Cup. It got TB to thinking why that is. Why is it that there is a huge section of this country that not only isn't enthralled by the World Cup but also is completely, unwavering against the whole show? First, there's the whole "soccer is dull" argument because there isn't a lot of scoring. TB used to think this way also, until he really started to watch it on the international level. The best game of the tournament so far might have been the 0-0 tie between Mexico and Brazil. Then there's the whole "the U.S. would be killing everyone if its best athletes played soccer" group. There is some merit to this. The best athletes in the U.S. play basketball and football - and lacrosse, obviously. The best athletes in the other 31 teams at the World Cup all play soccer. The attitude then essentially becomes "if the U.S. put its best effort, it would be the best team, but we don't, so why bother?" There is something to this. It's hard for TB to believe that Ghana, for instance, would be able to compete with the U.S. in something the U.S. really wants to try to win. Lastly, there is the fact that the U.S. has little chance to actually win. This one fascinates TB because of its insights into the American psyche. America loves to root for the underdog, right? But that seems to only apply when the underdog is playing another American team - or if the American underdog wins internationally. The Miracle on Ice, for instance, was the ultimate underdog story, and that, along with the political temperature of the day, is why it has become the No. 1 sports event of all time. But rooting for the U.S. soccer team if it isn't going to win, or possibly even advance? That's un-American, no? So TigerBlog gets it. Still, the World Cup is such a tremendous event, with such incredibly drama and fervor, that none of those other things should matter a little bit. And as for the fervor, that is something that the U.S. simply can't generate. Why? Is it because this country simply can't unite completely about anything? Ah, TB doesn't want to get all philosophical here. That's all he has to say about it today. Besides, he wants to talk about international basketball, not soccer right now. David Blatt has been a lifer coaching in Europe, with a 20-year run that includes stops in Turkey, Italy, Russia and most recently Israel, where he led Maccabi Tel Aviv to the Euroleague championship this past season. Blatt is a 1981 Princeton graduate who played for Pete Carril on the men's basketball team and was the captain of the 1980-81 team that beat Penn in a playoff game to get to the NCAA tournament. Blatt's introduction to overseas basketball came in Israel, where he played on the U.S. team that won a gold medal at the 1981 Maccabiah Games. His reputation as a basketball coach skyrocketed in recent years, first when he led Russia to the bronze medal at the 2012 Olympic Games in London and then with the Euroleague title with Maccabi Tel Aviv. And now he's back in the United States, with his first shot in the NBA, as head coach of the Cleveland Cavaliers. TigerBlog has a friend in Ohio who is an actual Cavs fans. Yesterday's messages: "anything would be better than Mike Brown again" and "I think we're paying three coaches that have been fired." The Cavs job is radically different if the team lures LeBron James back to town or if it doesn't, but the team should be improved even without James. With James it obviously would become an instant title contender. Blatt would never have gotten this chance even a decade ago. Now the basketball world is a much bigger one, and the selection of a coach with no NBA experience but a ton on international experience is seen as enlightened. TigerBlog counts six Princeton alums who are current Division I head men's basketball coaches - Princeton coach Mitch Henderson, along with John Thompson at Georgetown, Chris Mooney at Richmond, Joe Scott at Denver, Sydney Johnson at Fairfield and Mike Brennan at American. Blatt is Princeton's first NBA head coach since Butch van Breda Kolff. He's in a great situation in Cleveland, one that could expand exponentially with the right free agent domino. And now it's back to the World Cup. After all, Los Ticos play at noon. Had the United States men's soccer team been offered the opportunity to take one point from its game against Portugal yesterday without having to actually play the game, TigerBlog is pretty sure the answer would have been "where do we sign?" That would especially have been true five minutes into the game, when the U.S. gave up an awful goal to fall into an early hole. So why did it feel like the Americans lost when the final whistle of its 2-2 tie with Portugal - the fourth-ranked team in the world in the current FIFA rankings - sounded? It sure did, didn't it? TigerBlog can't remember too many situations like that, where a team came away with the outcome that it really hoped for and yet had it seem to be so crushing at the same time. The famous 29-29 Harvard-Yale tie in 1968 doesn't even fit, because a tie wasn't really what Harvard was hoping for, though it did lead to the immortal headline in the Harvard student paper: "Harvard Beats Yale 29-29." By now you know what happened in the U.S. Portugal game, which could be called a 2-2 loss. The U.S. rebounded from that awful goal to basically dominate Portugal. Even when the Americans still trailed 1-0, the sense that the game was turning was obvious. And then Jermaine Jones curled in one of the best goals TigerBlog has ever seen to tie it at 1-1 in the 64th minute. And then Clint Dempsey chested the ball in to put the U.S. up 2-1 in the 81st minute. It stayed that way through the 90th minute. Then TB saw five minutes of stoppage time, which is a lot, and thought "oh no." As it turned out, that was one minute - or 30 seconds - too much. Christiano Ronaldo made a perfect cross to set up Varela, and it was a 2-2 final. In fact, the final whistle was blown just after the U.S. restarted the game. Had the U.S. won, it would have clinched a spot in the knockout rounds and would have eliminated Portugal. Instead, all four teams in the group are still alive, as the U.S. plays Germany and Portugal plays Ghana Thursday, with both games at noon. The U.S. is still in great shape to move on, even if it loses to Germany. Should the U.S. win or tie, it would definitely advance. Should the U.S. lose to Germany, then it would still have a huge edge in the tiebreakers. As for the benefit of winning the group instead of finishing second, well, that's a big one. The first-place team in the U.S. group will play either Algeria, Russia or South Korea in the round of 16 (Sweet 16?). The second-place team in the U.S. group will play Belgium. That's a huge difference. Still, when the draw was announced, the goal for the U.S. was to simply make it through, something that seemed unlikely with the fourth-ranked Portuguese, the second-ranked Germans and the long-time nemesis Ghana. And now the Americans figure to get there. Of course, the team was so agonizingly close that it's hard to look at the tie against Portugal as a step in the right direction. The World Cup is like no other event in the world, and this country is really missing out on what it's all about. There is no national fervor surrounding the World Cup in the U.S. like there is elsewhere. TB emailed Diego Quesada, one of the men's lacrosse team's guides in Costa Rica in 2012, after "Los Ticos" knocked off Italy to go to 2-0-0 and clinch a spot in the knockout rounds. Diego said it was nuts there after the win. In the U.S. it would have been nice to win, but there are still way more "what's the fuss about" people than there are "this is the greatest sporting event in the world" people. TB was more into the U.S. team when Princeton's Bob Bradley was the head coach four years ago. Now he's rooting for the Americans, but he won't be crushed if it doesn't work out for them, as opposed to four years ago, when Ghana knocked the U.S. out. TB really wanted to see Bradley take the U.S. deep into the World Cup playoffs. There is still a Bradley on the U.S. team - Michael Bradley, Bob's son and a former Princeton ballboy. 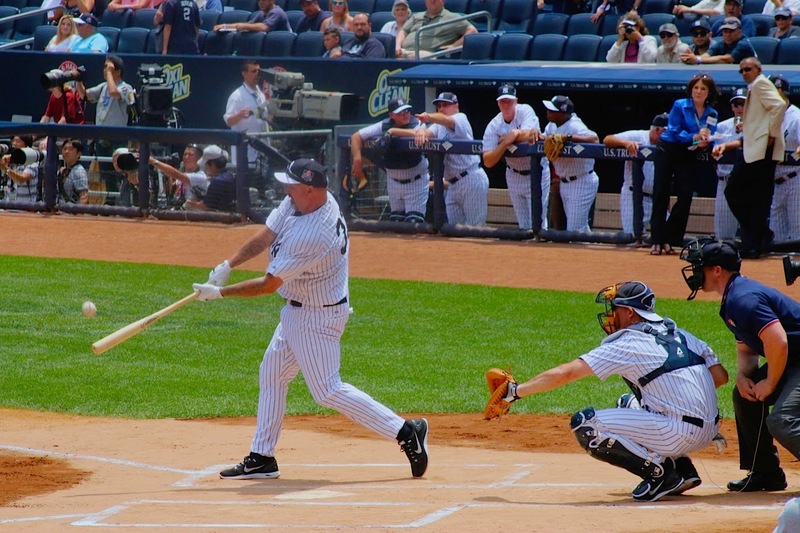 Shortly before Michael Bradley was about to play for the U.S. team, his uncle Scott - Princeton baseball coach Scott Bradley - was playing in the Old Timers' game at Yankee Stadium. Scott ripped a solid single to rightfield and the was interviewed on the YES network, where he was asked primarily about his nephew and the World Cup. It was pretty cool four years ago to have the Princeton baseball coach be the brother of the U.S. men's national team coach at the World Cup. It's not as cool this year, with only one Bradley on the U.S. team. Still, the game yesterday was fairly heart-stopping, and it was much of what makes the World Cup great. An early goal always make the game better, as it changes the strategy for both teams. And to have the U.S. team come back the way it did was awesome, and from simply a fan of great sports moments perspective, the ending was also ridiculous. And it sets up a wild Thursday to decide the group's two representatives in the next rounds. If you're still ho-humming the World Cup, you're missing out big time. TigerBlog was working at the flag football awards ceremonies yesterday for Special Olympics USA 2014 at the Lawrenceville School. The procedure was fairly standard. The teams would come across the stage at Lawrenceville's Kirby Theater, and each player's name would be announced as the medal was presented by one of the four New Jersey state troopers who participated or, for a few of the teams, by Cleveland Browns' cornerback Joe Haden. Then the athletes would be given bouquets of flowers and the teams would pose for pictures before the next team came out. There were the standard reactions of athletes who receive medals. Mostly there were smiles, high-fives, hugs among teammates, handshakes for everyone and anyone they saw as they as they left the stage. Then there was Anthony Deaton, from the unified team from Oklahoma. When Deaton - a tall, slender man probably in his late 20s to 30 - received his medal from the state trooper, he broke down in tears. He sobbed uncontrollably, thanking her profusely. He looked at his medal - a bronze - and cried again. It was a moment of pure, unfiltered joy. It was genuine emotion, and it was impossible to see it without becoming emotional as well, especially from TigerBlog's distance of about five feet away. For TB, it'll be one of the lasting images he takes from his time this week at Special Olympics, in a week that has been filled with lasting images. TB is also not alone among the volunteers to have this kind of experience. Greg Paczkowski - whose official title at at Princeton is Assistant Director of Athletics for Facilities and Aquatics but who really does a ton of everything - helped along with Karen Malec to plan and oversee the portions of the Games that have been held at Princeton. He asked TB earlier this week if he could write something about his own experience, and TB wasn't surprised to see that it mirrored his own.